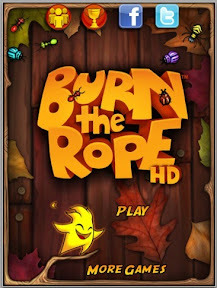 Burn the Rope HD is an iPad puzzle game that consist of several stages where you have to burn the majority of the rope to advance to the next level. It sounds simple enough, touch the rope at any section of the rope to catch it on fire. Watch the fire grow up the rope until the rope is all gone. Simple is not best way to describe this game. Another "s" word that would better describe this game would be "strategic". The fire will only advance the rope if it is burning upward. You can turn the shaped ropes both left and right in an attempt to keep the flames burning upwards. 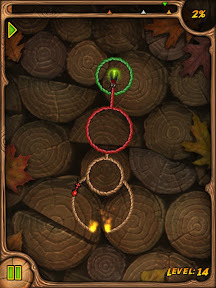 The difficulty of the rope patterns increase as you advance through the levels. Not only does the patterns get more tricky, but so does the objective. Bugs are introduced which when burned will turn the flames the same color as the color of the bugs. Some bugs explode when caught on fire. Some ropes are different colors, so you are required to burn the matching colored bug to produce the right flame color to consume that portion of the rope. In the picture above, notice that there is both a red ant and a red portion of the rope. The green bug at the top of the rope pattern is an exploding green bug, so you have to have that bug explode properly in the center of the green rope area. This game is both challenging and fun. Getting the rope to burn properly is not a simply task, but always an achievable task.